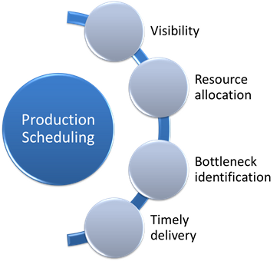 Production facilities need scheduling tools that have the power to facilitate the lean manufacturing principles that characterize the most successful assemblage operations, with system solutions that offer compelling scheduling data visualization and adaptive controls that respond to the constant stream of variables that daily bombard production operations managers. These scheduling tools must be able to also allow a natural lack of definition in the schedule rather than just optimizing by following clear (but often artificial) “black-and-white” rules. Incorporating a visual element into current or proposed ERP, APS, or MES solutions allows the users not only to benefit from superior algorithmic scheduling solutions and extensive domain expertise, but also from user controlled, drag and drop features which are imminently useful for achieving and maintaining lean production goals. Production scheduling is an essential process of every manufacturing company. It has an immediate impact both on the top and the bottom line of any manufacturer. The complexity of both supply and demand networks and of production processes has been ever increasing. Hence, scheduling seems to always face one or more of the four challenges represented in the graph on the right hand side. Many initiatives had been started to address these challenges. Many manufacturing scheduling software solutions had been invented and developed to master these challenges. Independent of how sophisticated they are, all of them share one element: they all include a graphical planning board to visualize the production schedule. 1) Increase Production Planning Visibility. Will my production order be completed in time? How is my resource utilization? What is the status of any production order or operation? This kind of manufacturing scheduling visibility typically is achieved with an interactive Gantt chart. The Gantt chart as planning board visualizes the production schedule and provides all relevant information at one glance. 2) Optimized Resource Allocation With A Planning Board. The planning board visualizes which operation had been allocated to which resource. It also shows free resources and often also the degree of capacity utilization. However, state-of-the-art Gantt diagrams do not stop at visualizing the schedule. They are interactive and allow the planer to intuitively change the resource allocation by drag and drop operations. Hence, the planer always has control and can make sure that he achieves a maximum utilization of all capacities. If the production planning application is based on a proper Gantt chart tool, it includes a histogram to visualize the utilization of all available resources. Typically, a histogram indicates a capacity overload with a signaling color (e.g. red) and hence the manufacturing planer can identify the bottleneck immediately. It is recommended to also provide a planning board view that shows all resources’ histograms on one view so that the planner identifies bottlenecks as well as underutilizes capacities. 4) Keeping Delivery Dates With Gantt Diagrams. Ultimately, the purpose of a thorough production planning is to achieve customer satisfaction. One key driver of customer satisfaction is the on-time delivery. With a visual production schedule, manufacturing companies are able to make realistic delivery time commitments to their customers. In addition to this, intelligent Gantt diagrams will alert them in case of delivery time violations. Want to learn more about how Gantt charts can contribute to mastering your production scheduling challenges? 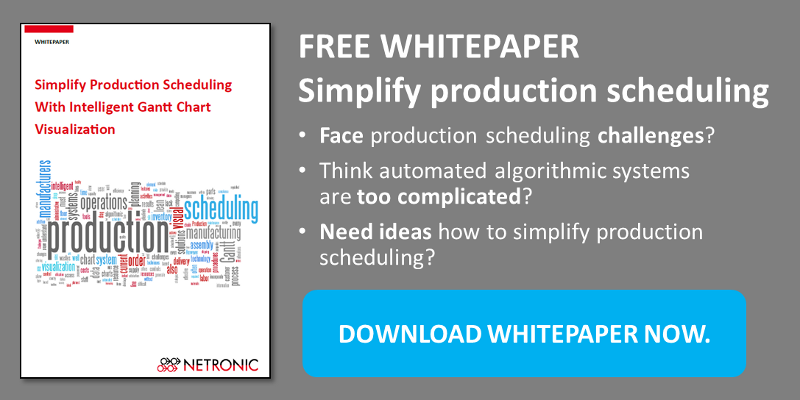 Have you ever thought of visual production scheduling instead of or complementary to an automated scheduling? Download our FREE WHITEPAPER to get more food-for-thought. Is your planning based on Excel? Are you sure that your speadsheet is error free? I also recomment the interview with Lee Cridland from Mercurius: What is good scheduling? or the podcast with Dave Weissman (ArcherPoint) about his experiences with scheduling.